When I think of Christmas makeup, I immediately think parties, glitter and red lips. That tends to be my go-to for most occasions, but during the festive season it's essential. So I present to you my foolproof, go-to Christmas party glam look. The best thing about it? It's completely customisable to your preference, it's easy and anyone can do it! I mean who doesn't have a red lipstick and brown eyeshadow hidden away somewhere, right? I wanted to create a flawless base so that all the attention is on the lips and the eyes. I love the Loreal 24H foundation for this as it's so affordable, yet has great coverage and an even better staying power. To build on my base, I always use my Anastasia Contour Kit to bronze, I'll usually add a stronger contour, but I wanted to keep the face as soft as possible for once. Makeupgeek's blush in 'spellbound' is such a dream to work with, it gives a beautiful pink flush to the face and can transform you from ghostly to alive in about 0.2 seconds. We can't forget about that glow though, I tend to pack on my highlight until I resemble a disco ball, but you do you! For the eyes I kept it pretty simple with three shades of brown eyeshadow from Anastasia Beverly Hills. I deepened the crease and added a soft wing to elongate the eyes, then I added some glittaaaah honey! I topped it off with some natural, fluttery lashes (these are my FAVOURITES from nubounsom lashes, so comfortable to wear!). The final step? Red lipstick. I find that a bold lip completely ties softer looks like these together perfectly, and this shade 'bloodline' from ABH is certainly the perfect true red. I'm so over the moon with how this look turned out, and it looks like I've got my Christmas eve makeup sorted! Anastasia Beverly Hills Dipbrow (Shade: Chocolate) - In depth brow review here. Would you wear this makeup? 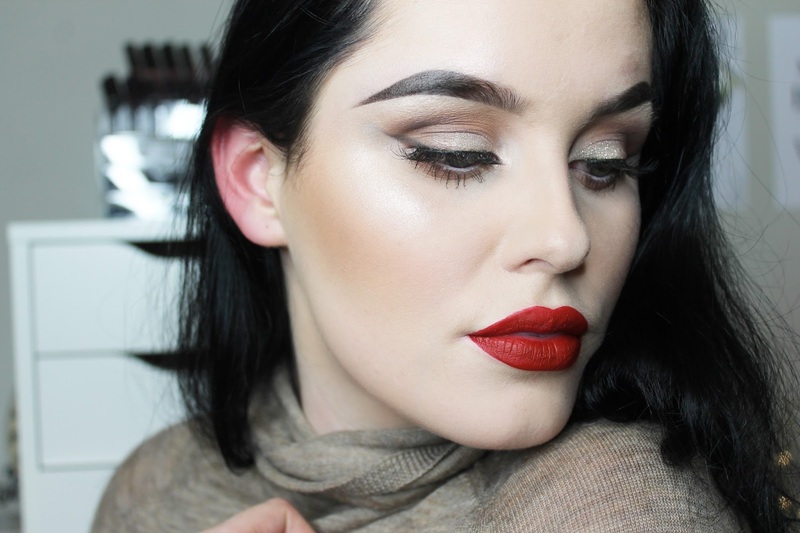 What's your favourite look to create for Christmas? 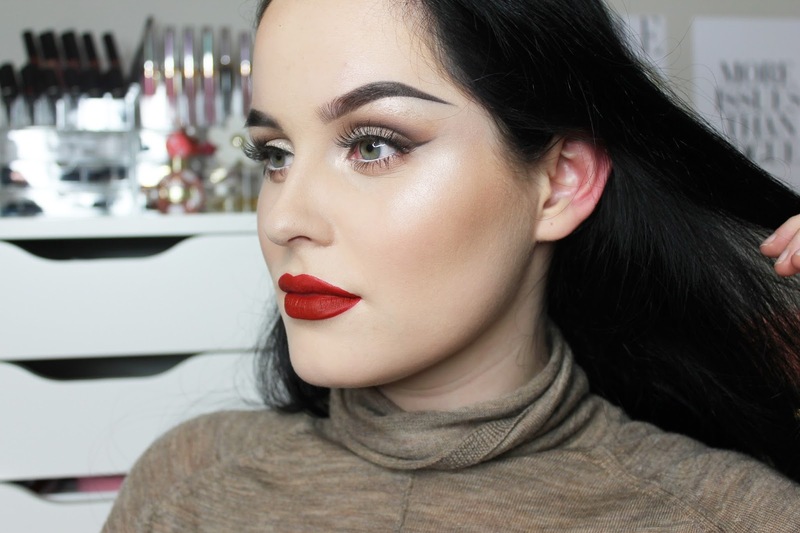 I love a red lip for the holidays, it looks so festive! You've created such a stunning look! You are very fast becoming my favourite beauty blogger, this look is just so perfect. P.S: I'd love you to do an eyebrow pictorial! Such a beautiful look ... I always wear red lips at this time of year! And pack on the highlighter! Also I cannot get over how perfect your eyebrows are! Love love your blog so much girlie! You're so pretty. This foundation seems to work amazingly! You are seriously so stunning and that lip color looks gorgeous on you Isabelle! Love love love this red lip! I've been wanting to try a ABH lippy for a while now. I may just have to pick this up just because of you. Thank you!!! Fantastic look - the lips really pop. This look is so beautiful and your eyebrows are amazing, along with your whole face, duh! Your pics are stunning too!! What camera do you use?